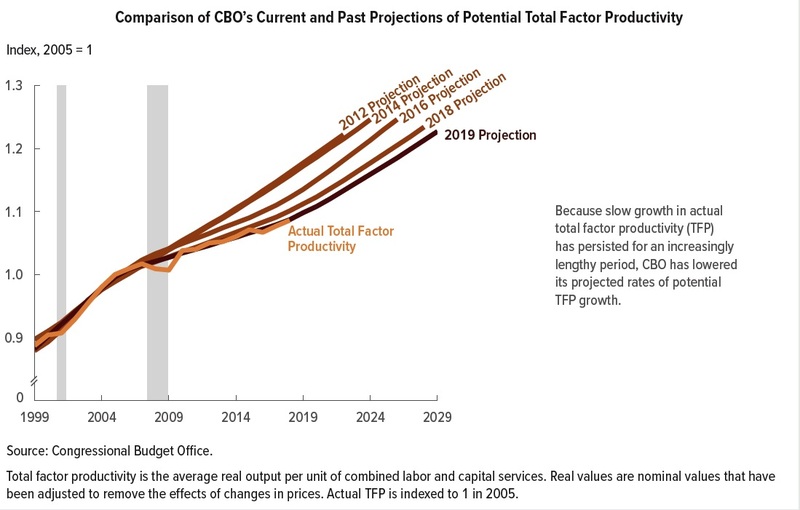 Tim Taylor reviews the CBO's commentary on the productivity slowdown. The reasons for it are not at all clear. My own bias -- not proven -- is that the value proposition if both services and intangibles is perhaps impossible to quantify in cash/commodity terms, beyond simple cost. Services are a lousy store of value. If you hire cleaners to clean your house for $100, for example, what it the value created? If one says "a clean(er) house", it will be hard to put a number on it other than the TIME, in hours, it saved the homeowner. But what does the homeowner do with the time? Some will use it to create more commercial value. Some not. Of the latter, some will use the leisure to improve their "human capital" in diverse ways, but these improvements will be difficult to quantify. By a different route, the same may be true of intangibles, including software. Where is the line between an idea (an inherently 'public good', acc to classical economics) and its digitized version -- a computer program, or formula, or drawing? Also very difficult to convert to a quantifiable, discrete entities, like 'hours of homogenized labor power', followed by guesswork to calculate the economic values of the parts that can be quantified. Another bias, also not proven, is that the dramatic increases in the percent of the work force engaged in physical vs service/intangible products is undermining the foundations of commodity production, and thus, capitalism. "Over longer periods, however, years of comparatively steady TFP growth tend to be followed by rather abrupt transitions to years with steady but substantially different growth. For example, estimated trend growth in TFP remained relatively strong in the 1950s and 1960s, slowed considerably from the early 1970s to the mid-1990s, and resurged in the late 1990s and early 2000s. Around 2005, a few years before\ the recession and financial crisis that began in 2007, TFP growth again slowed in many industries and throughout the international economy. 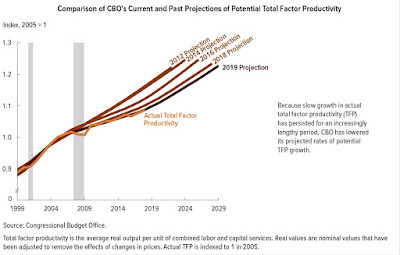 In CBO's estimate, TFP growth in the domestic nonfarm business sector was only about one-third as rapid during the 2006–2017 period as it had been from 1996 to 2005."